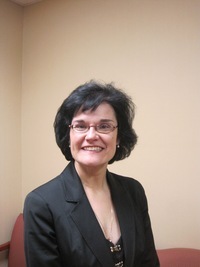 You are here: Home / About Us / Optometrist Mary Ann K. Rubis, O.D. Dr. Mary Ann K. Rubis earned her optometric degree from the New England College of Optometry in 1989 and has been practicing in the Springfield, Massachusetts area for more than 17 years. She brings significant patient-centered and contact lens experience to the practice and will continue to provide comprehensive eye care, contact lens evaluations, and refractive surgery assessments for her patients. Dr. Rubis is a member of the American Optometric Association, Massachusetts Society of Optometrists and is President of the Zonta Club of Quaboag Valley. To schedule an appointment with Dr. Rubis or one of the eye surgeons at our Springfield, Massachusetts office, contact Papale Eye Center today. If you would like to schedule a cataract surgery, glaucoma, or LASIK screening with our eye surgeons, contact our Springfield, Massachusetts eye surgery center today.